 According to the court’s decision, Nizami district Court’s verdict of June 01, 2016 was upheld. Baku Court of Appeal, chaired by Judge Aflatun Gasimov, held a hearing on the protest appeal filed by public prosecutor Asadulla Ramazanov against Nizami District Court’s verdict of June 1, 2016 on sentencing journalist and NGO activist Elchin Hasanov to one year of corrective labor under Article 221.1 of the Criminal Code. Elchin Hasanov’s lawyer has also appealed the judgment. Elchin Hasanov was charged under Article 221-3 (hooliganism committed by using cold steel) of the Criminal Code in March 2016. By its judgment of June 1, 2016, Nizami District Court reclassified the charge against Elchin Hasanov from Article 221.3 to Article 221.1 (hooliganism) of the Criminal Code and sentenced him to one year of corrective labor, under which 20 percent of his monthly salary will be deducted. At today’s hearing, the presiding judge said the appeal hearing would be conducted through a partial retrial on the initiative of the court and the expert, who had given her opinion on the case, was invited. Thus, expert Naila Abilova, who had given the opinion on the injury of victim Jafar Jafarov, testified at the hearing. The expert reconfirmed her expert report. The judge asked what was meant by a blunt object. The expert said “blunt object” was a broad term. The judge then asked whether a fist was considered a blunt object. “It depends on how the punch is delivered. For example, during a punch fingernails can touch the person’s face and injure him,” the expert replied. Afterwards, public prosecutor Rizvan Shammadov said he stood behind the protest appeal and requested that Nizami district Court’s verdict of June 01, 2016 be revised, Elchin Hasanov be convicted under Article 221.3 of the Criminal Code and be awarded a stiffer penalty provided for by the vindicatory part of that Article. 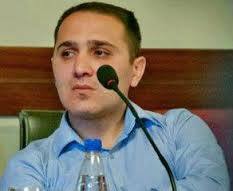 During his final speech, journalist Elchin Hasanov asked the court to deliver only a fair decision. After a 3-minute deliberation, the court announced its decision to uphold Nizami district Court’s verdict of June 01, 2016.